Kaimana Divers (web site http://waikikiscuba.com ) has been providing scuba divers with the best value, variety and quality in diving since 2006. Their team of experienced divers will lead you to experience to some of the best diving in Waikiki, Honolulu and other locations around the Hawaiian Islands. 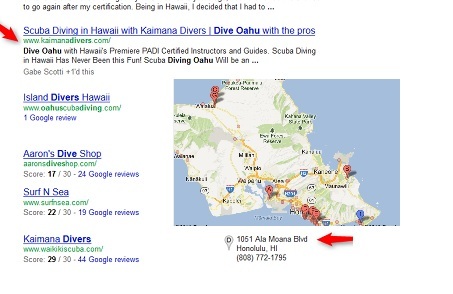 When a FanZappy SEO expert started to help Kaimana Divers with their SEO effort, they were averaging around 70 visits to their site each day and had no page one rankings or Google Plus Local Listings on the first page. They are now averaging around 275 visits to their site each day and have many page one rankings for targeted keywords and page one Google Plus Local Listings. Kaimana’s organic Google search and Google map rankings are moving towards the top. They are now shown the the first page for more online real estate and visitors.